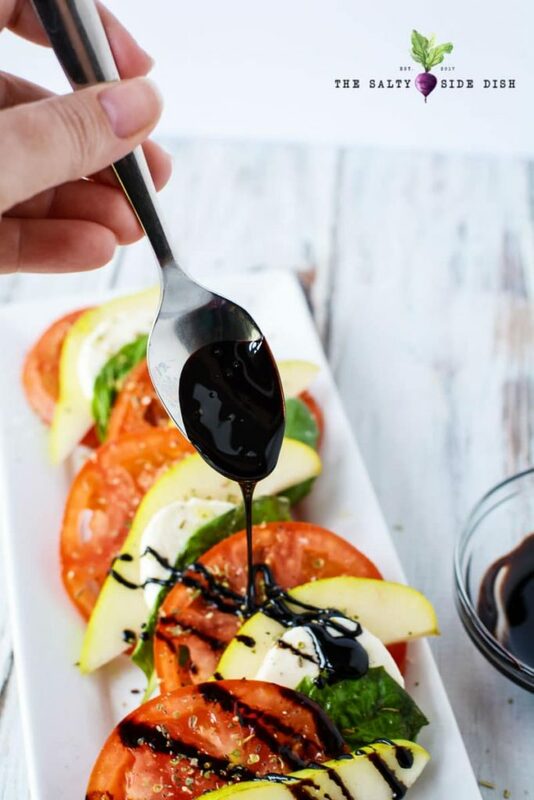 Balsamic Vinegar Reduction is a thick simple glaze that that finishes up your caprese salads with the perfect balance of tangy and sweet. No matter whether its antipasto appetizer skewers or a full plate of tomato and cheese, this Balsamic Vinegar Reduction Recipe is the perfect consistency to finish your Italian recipes. 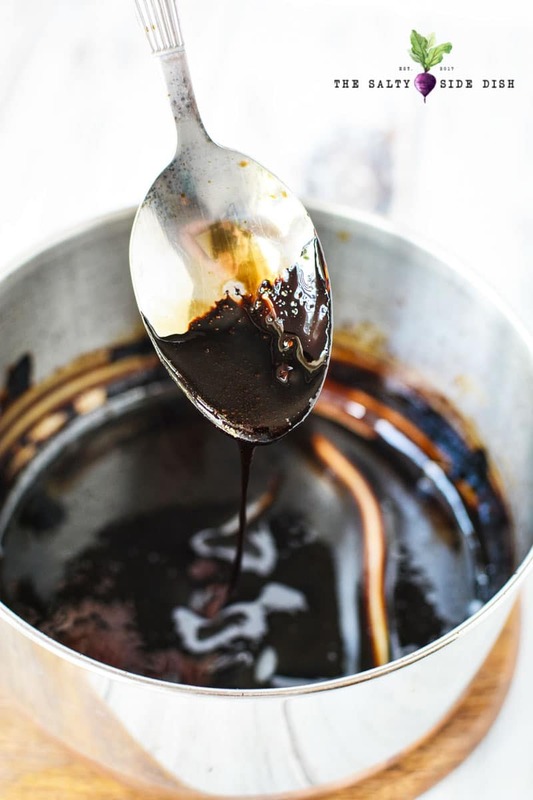 You won’t believe how easy it is to make a balsamic glaze. Used often as a salad dressing or reduction and made from balsamic vinegar, this slightly sweet and slightly sticky syrup is perfect poured right on the top of all your favorite caprese recipes. Hit “skip to recipe” to go straight to the recipe if you already know about vinegars. Use a true traditional balsamic vinegar or an aged balsamic vinegar for the best flavor. Like all vinegars, balsamic vinegar is made from the fermentation process – just like your favorite adult beverage. Authentic and high-priced balsamic vinegar is traditionally made from sweet white grapes – Trebbiano and Lambrusco varieties are used in the most expensive types of vinegar. These grapes are pressed with the skins, stems, and seeds together to create what’s called grape must. This must is cooked slowly until it reduces and thickens slightly. This concentrates the flavors and starts developing the syrupy texture that makes balsamic irresistible. From this first reduction, traditional vinegar is then left to ferment in a series of casks, each smaller than the one before. Each cask is made out of a different type of wood – mulberry, juniper, cherry, oak, and chestnut are typical. Each of type of wood adds a unique flavor to the vinegar, making the end result incredibly complex. As the vinegar ages in the casks for at least 12 years, the alcohol ferments and evaporates, leaving behind the beautiful liquid gold we know. However, not all balsamic vinegar is created equal – as you might guess looking at the price tags in your grocery store. But, before you buy, it’s important to understand the three main types of balsamic vinegar, so you know exactly what it is you’re getting. The primary feature of traditional balsamic vinegar is the length of time it ages. Bottles are topped with specially colored caps that correspond with the length of time the vinegar ages. 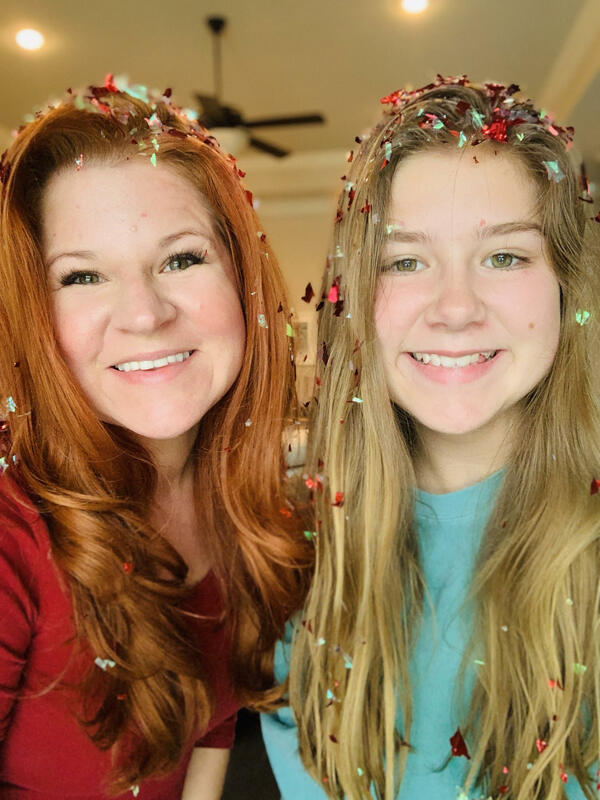 12-year-old vinegars get a red cap, 15 – 20-year vinegars silver, and 20 – 25 years get a gold cap. The flavors in these long-aged vinegars are smooth and well-blended. You can pick up the various fruity tones in the thick, syrupy liquid that feels like velvet on the tongue. Underneath the sweetness, there should be a hint of smokiness from the barrels used for aging. While all that sounds wonderful, it comes at a cost – sometimes even hundreds of dollars for a few ounces. If you decide to spring for an authentic vinegar, make sure your vinegar is labelled as Aceto Balsamico Tradizionale and includes the European Union certification stamp – D.O.P. Only bottles with this name and stamp are traditional authentic balsamic vinegar. Balsamic vinegar of Modena is nearly the same at the traditional version – it’s made using the same basic techniques but doesn’t meet the same (and super precise) standards traditional balsamic goes through. It might be aged for a shorter period of time, produced outside of the Modena region, use different grapes, or other ingredients are added to the grape must for various reasons. These vinegars are still thick and smooth, but the flavors are less complex, and the vinegar is usually more acidic and less sweet than the traditional version. Typically, these types of vinegars are aged less than two years. This type of vinegar should come with an I.G.P. stamp which is a European Union designation that the balsamic is still made from specific grape varieties, but these can be grown anywhere so long as they are processed in Modena. It’s a way of certifying the quality of the vinegar while making it easier to produce enough to meet consumer demands. It might seem simpler to head to the grocery store and just buy a bottle of pre-done balsamic glaze but don’t! Really! 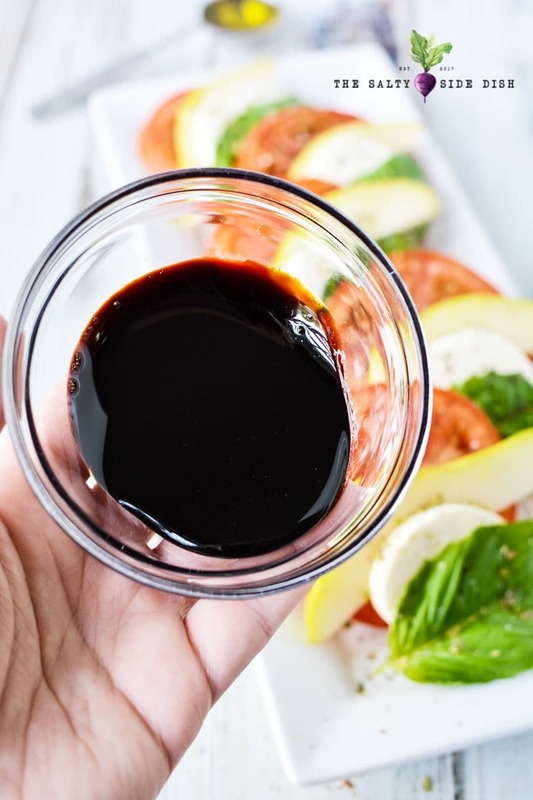 Balsamic Vinegar Reduction is a thick simple glaze that that finishes up your caprese salads with the perfect balance of tangy and sweet. No matter whether its an antipasto appetizer skewer or a full plate of tomato and cheese, this Balsamic Vinegar Reduction is the perfect consistency to finish your recipes. If you’re flipping through cookbooks or browsing recipes on Pinterest, you’ve likely come across a slew of balsamic vinegar recipes. You’ll find the syrupy sweet vinegar in pretty much any dish – from appetizers and salads to mains and dessert. But, what do you know about it? There’s a lot of mystery surrounding this little bottle of heaven – from how it’s made to how it’s priced. Today is the day we solve all the balsamic vinegar mysteries, bonus if you do it while eating Ensalada Caprese. Practically much of what we see in the grocery store, especially in inexpensive bottles, is imitation balsamic vinegar. Some of these are quite tasty and well-made, but they are a far cry from the luxurious flavor and texture of the traditional balsamic vinegar. These vinegars are often blended with other colorings and flavors to replicate the more expensive vinegar at an affordable price point. Imitation balsamic vinegars can be produced anywhere in the world – some replicate the production of more authentic vinegar and are of good quality. Others are best left on the shelf. So, how can you tell whether one imitation balsamic is better than another? Check the ingredient list! Balsamics with only grape must are closer to the traditional and will have a more authentic flavor. If the balsamic includes vinegar, grape must, and other flavorings, it’s basically a vinegar designed to imitate the colors and flavor of the original. While these can be perfect for cooking or salads, it can take a bit of experimentation to find one you like. Like all vinegar, balsamic offers an array of health benefits. Personally, it’s the most delicious vinegar for the types of dishes I love, like this Caprese Pizza Recipe, so it’s the easiest way for me to get my vinegar nutrition! One of the most well-studied and supported health benefits of balsamic vinegar is its cholesterol reducing properties. The antioxidants in vinegar help capture the toxic cells in the body that increase your LDL levels. In the serving in a simple salad, you can get enough vinegar to start getting the cholesterol lowering benefits. Balsamic vinegar also aids in weight loss and digestion – the acetic acid in the vinegar is a treasure trove of probiotics that support digestion and help you feel fuller longer. Balsamic vinegar can also help regulate blood sugar and boost circulation – both of which are critical for those suffering from diabetes. It can also help lower your blood pressure, protecting your heart. No matter why you eat it – whether it’s for the one-of-a-kind velvety sweet flavor or the numerous health benefits, grab a drizzle and head for the table.